Former senator Evangelina “Eva” Estrada Kalaw was remembered on Thursday by her former colleagues and friends as one of the prominent voices who fought the Marcos dictatorship. 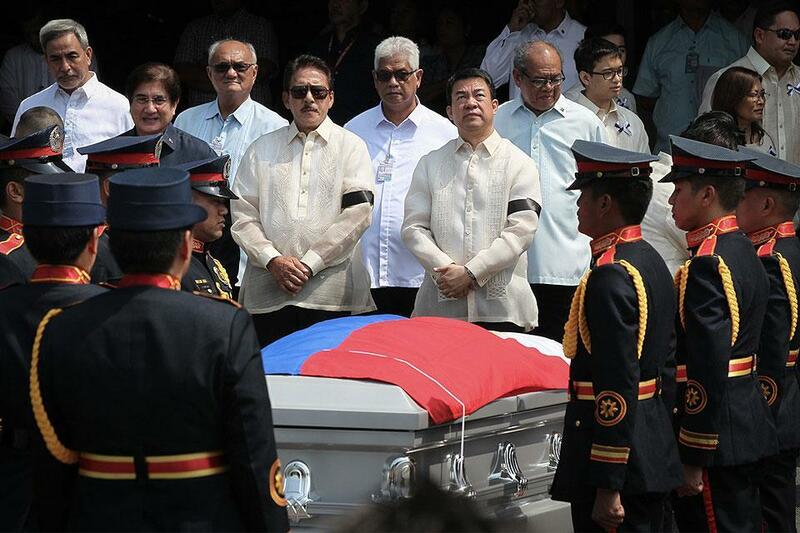 The Senate held a necrological service for the former senator who passed away last May 25 at the age of 96. “She was our mentor, our team leader, she was our inspiration in our quest for political victory and one of the voices, with much courage in fighting for what is right for the good of our country and people,” Ilarde said in his eulogy. Kalaw was a known opposition leader during the Martial Law years under former President Ferdinand Marcos. She was the lone woman in the iconic photo taken outside the padlocked Senate session hall in 1973. “We pray that is not the last Senate when the last martial law is declared,” Ilarde quipped amid the declaration of martial law in Mindanao, and President Rodrigo Duterte’s statement on the possibility of expanding it nationwide. “I can almost hear the honorable Senate President Koko [Pimentel] saying ‘that is not funny’,” he added. “We need the likes of senator Eva, who will be asking the foolish questions of the day, Where is the invasion? Who are the invaders? Where is the rebellion? Who are the rebels? But unfortunately, what we see now or hear are echoes, not voices,” Saguisag said. Under the 1987 Constitution, the President may declare martial law in cases of invasion or rebellion. Former senator Teresa Aquino-Oreta said Kalaw was the epitome of courage. “The Marcoses were very well-entrenched in power, people were afraid, and the press was silenced; and freedom, democracy and human rights were words used only by the opposition. And so-called friends have abandoned, leaving a few brave men who dared o be identified, among them was this lady, senator Estrada Kalaw. She was unafraid,” Oreta said. Senator Risa Hontiveros, for her part, hailed Kalaw as a “remarkable” woman. “I can only pray that when it is our turn, we muster but half of her courage and fire,” she said. Senate President Pimentel, meanwhile, vowed to continue the public service of Kalaw. “She may have been born in a different era, but the values of integrity, respect for the rule of law, and dedicated service to the people that she believed in and practiced remain as relevant as ever. Tita Eva, we are here to continue your causes,” Pimentel said. Kalaw was the fifth woman to be elected in the Senate in 1965 and, in 1871, was the first woman to win a re-election. She served with fellow female Senators Magnolia Antonino, Maria Kalaw Katigbak, Helena Benitez and Tecla San Andres Ziga during the sixth and seventh Congresses. During her stint as senator, Kalaw authored 41 bills, including the salary standardization for public school teachers, creation of Local School Boards and the Education Financing Act. She was the chairperson of the Senate Committees on Games and Amusement as well as Tourism and the National Minorities. Kalaw was also the founder and chairperson of Samahang Filipina and was the first president of the Jayceerettes foundation.